Critics of the tech industry's impact on San Francisco used dramatic tactics outside Google's developer conference on Wednesday. SAN FRANCISCO (KGO) -- It's Google versus Stormtroopers. Critics of the tech industry's impact on Fan Francisco used dramatics tactics outside Google's two-day developer conference, which got underway Wednesday morning at the Moscone Center. The conference is attracting more than just the tech crowd. One protest took place Wednesday morning and another was scheduled for noon, as Google faces some criticism about its business practices. It's good to be number one, especially in this line. Thousands of people lined up around the Moscone West building to get in for the keynote address. The line was so long that the people at the end had a good view of the front. "We've got a long way to go," said San Francisco resident Steve Cary. When asked if she was ready to walk around the block, Google I/O attendee Holly Campo said, "Absolutely, absolutely. Nice weather. I'm from New Orleans. It's 90 degrees there." Donuts and coffee help make the wait bearable. But the long line meant this group of protesters had a captive audience. Union activists and others dressed in Star Wars costumes, asking Google to be a force for good. They say tech companies are pushing the divide between the haves and have nots in the Bay Area, and want Google to increase wages for its lower paid contracted workers. "Google uses a private contractor called SIS to hire and employ their security workers," explained protester Erin McElroy. "They're not being paid fairly. They cannot even afford to live in Silicon Valley or in the Bay Area for that matter. They're having to move out to surrounding suburbs and commute to work. Another protest hit home overnight at Google's Mountain View campus. 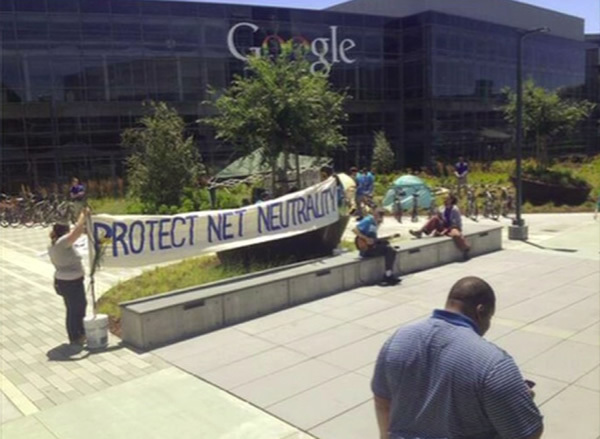 Photos show a group calling itself "Occupy Google," that supports net neutrality. Protest at Google's headquarters in Mountain View. Police say Google allowed the 20 or so protesters to stay on its private property during the day, but asked them to leave at night. Officers say some left. But some didn't, leading to 10 arrests for trespassing. The group plans on protesting at the developer's conference in San Francisco. But people we spoke with didn't seem concerned about the activity outside. When asked if it matters to him, Texas resident and Google I/O attendee Rahul Behera said, "No, not at all. Yeah, I'm not really sure why they're protesting, so I'm not, yeah." Developer and I/o attendee Amanda Poray added, "Not really, I haven't thought about it. I'm really just focused on what's going on inside." Google sent a statement to ABC7 News regarding the protest. It reads, "Since 2011 we've given more than $70 million to local projects and employees have volunteered thousands of hours in the community. We're excited to be expanding that work in 2014 (and) as for the protesters, may the force be with them." Meanwhile, inside Moscone West, a crowd of 5,000 oohed and ahhed several times during Google's keynote presentation; and for good reason. To learn more about what Google unveiled on Wednesday, click here.